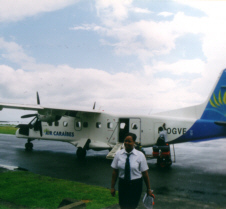 Unfortunately, there are no intercontinental flights to Dominica directly yet, so visitors have to fly to one of the surrounding islands first, such as Martinique or Guadeloupe. Air France or Air Caraibes (Corsair) take you to Guadeloupe (airport PTP) or Martinique (airport FDF) via Paris. Lufthansa offers a flight to Antigua from Frankfurt, which is very expensive, though. There are daily flights to Dominica from Antigua, Barbados, Guadeloupe, Martinique, Puerto Rico, St. Lucia and St. Martin. Most of these are operated by Liat. 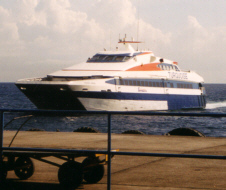 The modern catamarans are able to carry more than 300 people. The crossing from Guadeloupe and Martinique takes about one and a half hours. 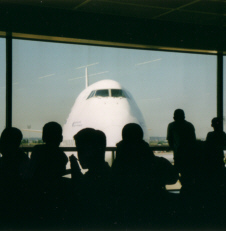 The trip is offered several times a week. Online bookings (via E-Mail) are available at Express des Iles.